The kid was right candy doesn’t taste good… was better when the original owners had it .That was good candy !!! I think that the Arnold family needs to buy the place back. The new owners are ruining the Arnold name. 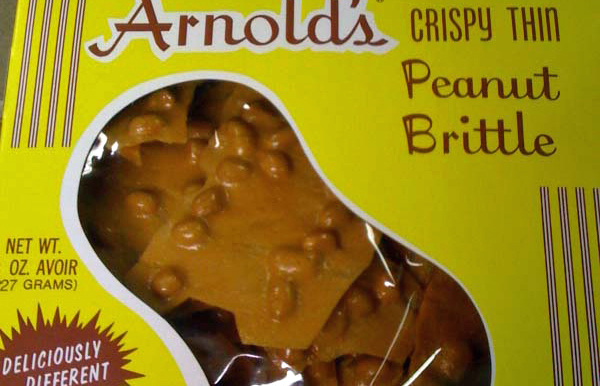 I don’t think that they know how to make the quality products that the Arnold family made. Definately not the same!!!!! I just purchased some peanut brittle. It was awful. It was not as thin and the peanuts don’t taste the same. It is not Quality at its best as they claim. I found out the reason for the poor quality was that the Arnold family had sold it to someone who has no experience in the candy making business. Big mistake. I will never buy their candy again !!! tThe chocolate peanut brittle was double the price from last year, and the chocolate tasted cheap and waxy . For the price I paid I would have expected them to use fine quality chocolate ! !